For the holidays this year, I got out of town – and into the woods. A friend offered the gift of her lakeside cabin for a week. It was incredibly quiet and peaceful – perfect for reading books (I did a lot of that) and also for walking. 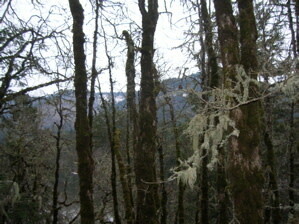 During my week’s stay, I explored the woods, slopes, steppes and riverbanks of the Columbia River Gorge. 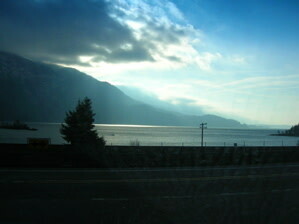 Prior to this trip, I’d never spent more than a day or two at a time in the Gorge. What a difference it makes to remain in one place for a length of time. In the winter, few people are around and the wintery austerity of rock, water and earth are heightened by the shifting weather. 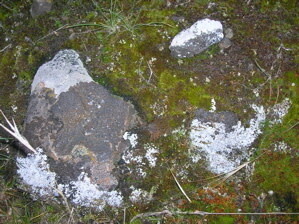 I grasped – as I had never quite done before – the utterly unique environment in the Gorge. 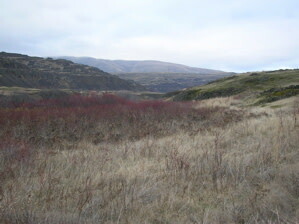 Driving slowly from west to east and back again – many times – I had a chance to really observe the shift from the damp, forested west end of the Gorge to the dry woods and prairie land that predominate in the east. 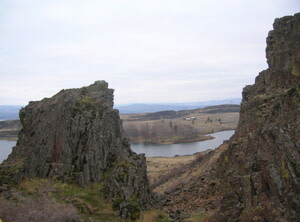 Considering that rainfall varies from about 40 inches per year in Portland to 14 inches per year in The Dalles, it should be no surprise that the plant life should also vary dramatically from one end of the Gorge to the other. 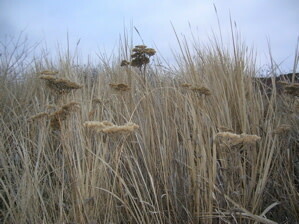 I was entranced by the exquisite colors of the native plants during their winter rest. I hope my photographs can convey just a taste of the beauty I saw at some of the stops. 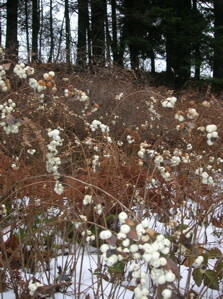 Snowberry fields forever… that’s what kept going through my mind when I saw this! 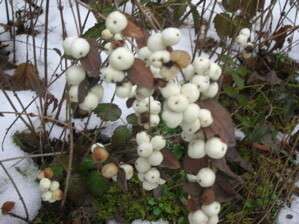 I discovered these creeping snowberry (Symphoricarpus mollis) near the White Salmon River. It’s a great garden plant, too, with pretty blue-green, roundish leaves, tiny pinkish-white flowers and then these extraordinarily beautiful winter decorations – enjoyed, of course, by birds. 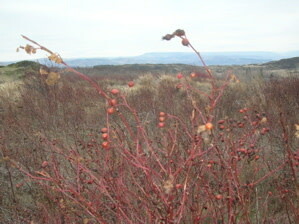 I’d heard that native manzanita grew in the Gorge but never seen it myself. 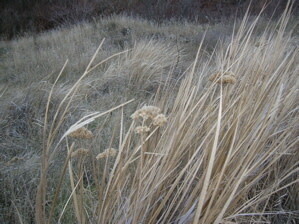 I finally spotted this clump growing near Wind Mountain. 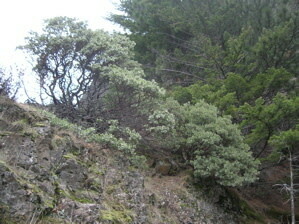 That hairy manzanita (Arctostaphylos columbiana) grows in the Gorge is a testament to its wind-, drought- and cold tolerance. It’s easy to grow in gardens, given good drainage, a half to full day of sun and no supplemental summer water. 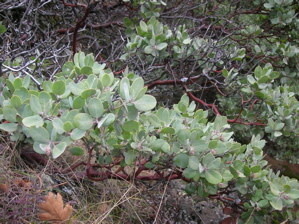 Hairy manzanita up close – notice the sinewy, smooth, reddish bark. This clump of plants had particularly nice powdery blue leaves. 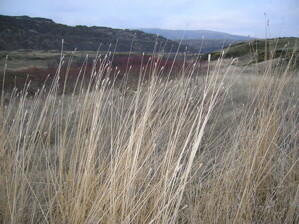 I must look up the name of this grass. 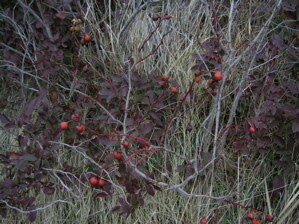 It was so beautiful, particularly set against the warm reddish twigs of the wild rose (background). Also, the new schedule of classes and outings should be posted soon on the Berry Botanic Garden website. Every year, Berry holds several field trips to places of botanical and geological interest. Check back to the site for 2010 classes.